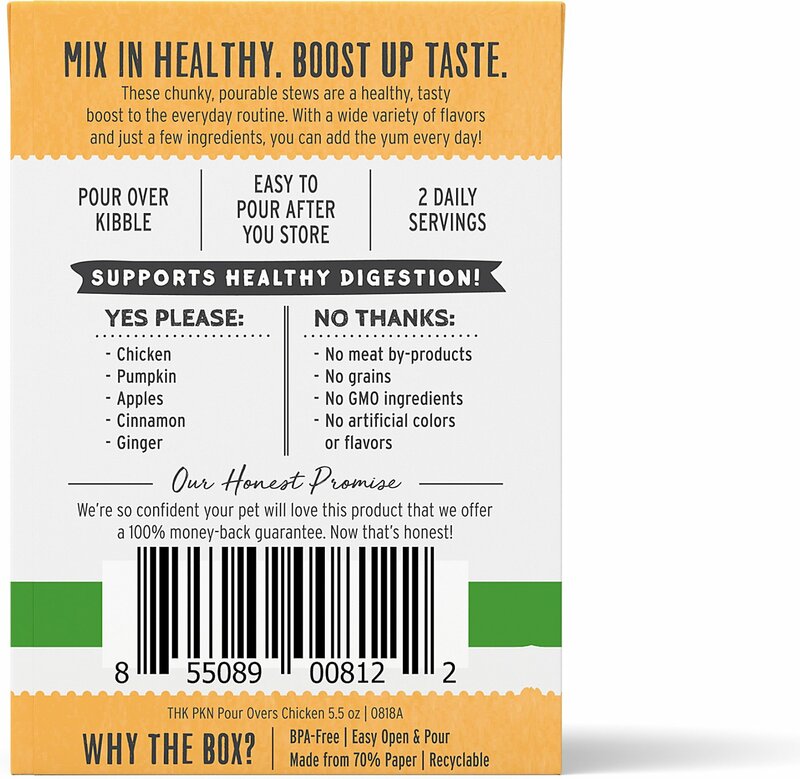 Jazz up your canine’s dry dog food with The Honest Kitchen Pour Overs Stew Wet Dog Food Topper. Made with just nine ingredients including chicken bone broth, chicken, pumpkin, apples and butternut squash, this recipe serves as a delicious and nutritious stew that’s pourable too! Every Pour Overs topper is specially designed for intermittent or supplemental feeding only. 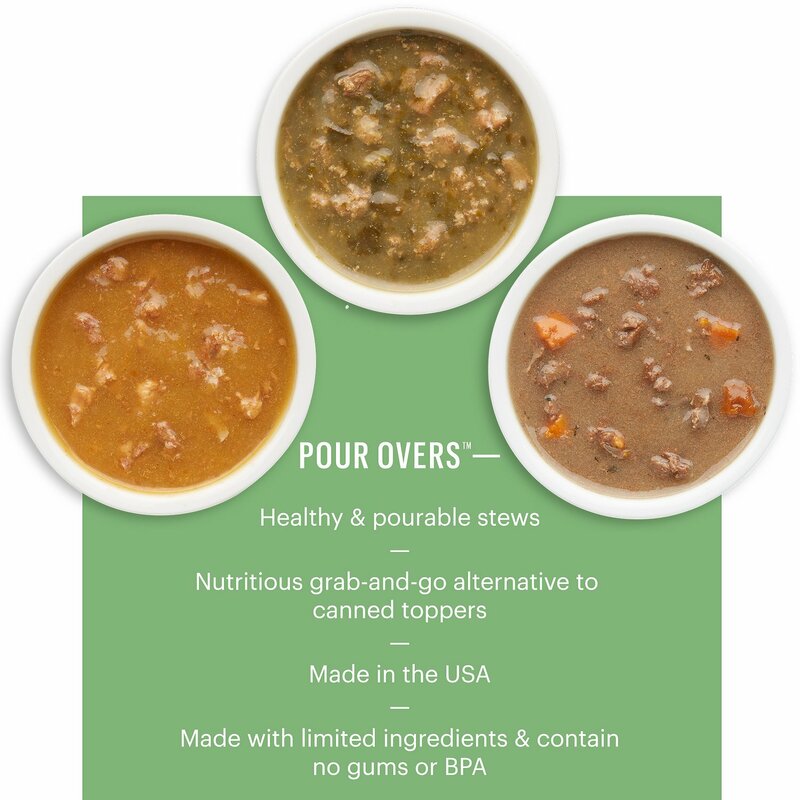 With a wide variety of flavors to choose from, each slow-cooked stew is grain-free and made with 100% natural ingredients you can trust and all the tail-wagging taste your dog will love! 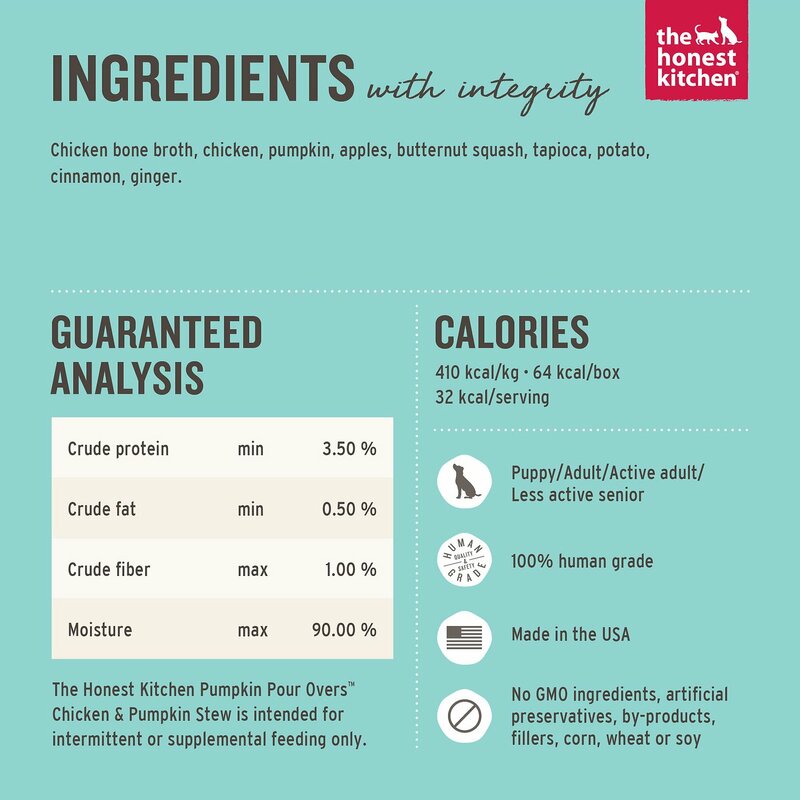 Meal enhancer made with chunks of real diced free-range chicken in a pumpkin and apple puree to support healthy digestion for dogs of all breeds and ages. Chicken Bone Broth, Chicken, Pumpkin, Apples, Butternut Squash, Tapioca, Potato, Cinnamon, Ginger. Use these healthy stews as a topper or snack. Not intended to be served as a whole meal. If feeding as a topper, reduce dry food by 1/8 – 1/4 cup daily to help maintain healthy weight. Do not microwave this container. Refrigerate unused portion, stays pourable! 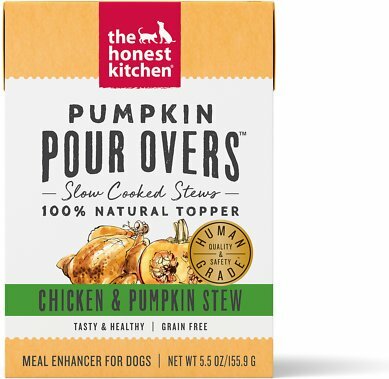 The Honest Kitchen Pour Overs allow you to upgrade your dog's meal with tasty slow-cooked stews. These 100&percnt; natural, grain-free toppers are crafted with the perfect combination of flavor and optimum nutrition. Simply pour one of these meal enhancers over your pup's favorite food for an added boost of protein and antioxidants that will also help to support healthy digestion. Each Pour Over recipe comes in a BPA-free carton that holds two servings. The classic carton design is easy to open, pour and close for a mess-free meal that both you and your dog will appreciate. And unlike other wet food, these toppers stay at a pourable consistency even after the container has been opened and refrigerated—so you can use one serving today and the second serving tomorrow. 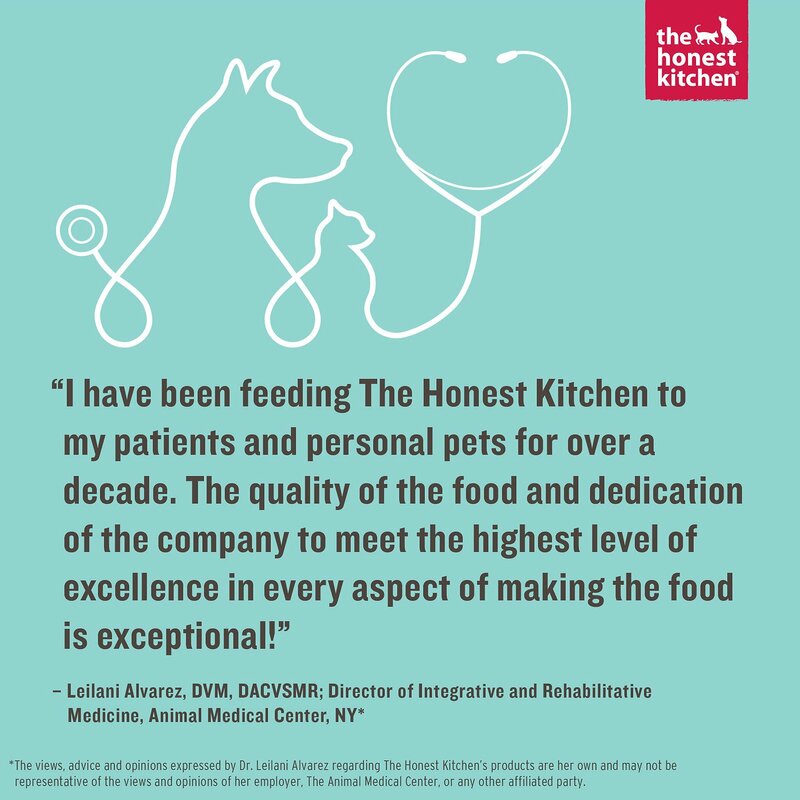 The Honest Kitchen has three lines of Pour Overs for your dog to enjoy. Support his digestive tract health with free-range chicken in a pumpkin and apple puree, or add a boost of protein with ranch-raised beef in a savory bone broth. For a healthy dose of antioxidants, choose the recipe with spinach, kale, broccoli and turmeric. No matter which recipe you choose, you know he's getting nutrition from a brand you can trust. FEATURES All-natural dehydrated, human-grade dog food made without any grains or gluten. Great for dogs with grain sensitivities. All-natural dehydrated human-grade dog food made with organic grains. Wholesome recipes for price conscious pet parents. All-natural dehydrated, human-grade dog food made with only 6 ingredients. Great for dogs with sensitive stomachs or food allergies. All-natural dehydrated, human-grade base mix where you add your own protein or raw dog food. Great for home cooks or dogs with protein restrictions. All-natural dehydrated, human-grade superfood clusters. Add to your dog's favorite food or serve as a tasty treat for a boost of nutrition. All-natural dehydrated, human-grade superfood clusters. Add to your dog's favorite food or serve as a tasty treat for a boost of nutrition. HUMAN GRADE Check Represents a successfully completed task. Check Represents a successfully completed task. Check Represents a successfully completed task. Check Represents a successfully completed task. Check Represents a successfully completed task. Check Represents a successfully completed task. 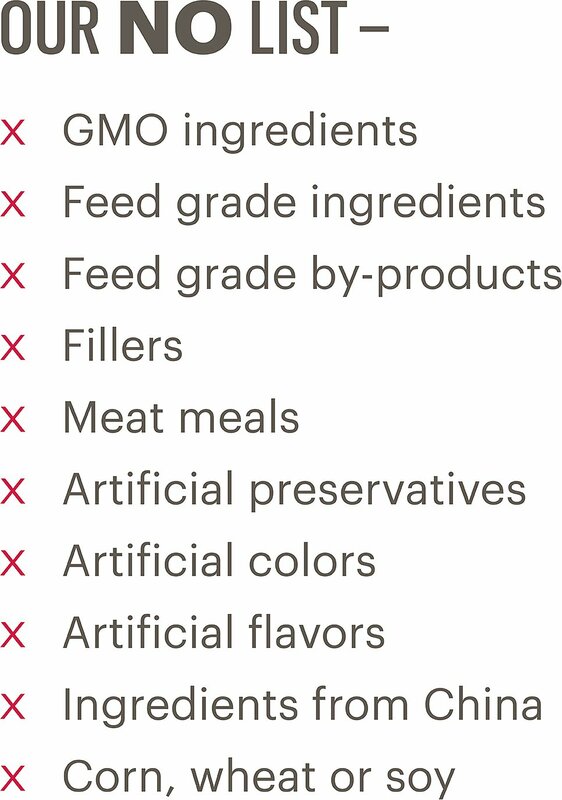 NO BY-PRODUCTS FILLERS, AND ARTIFICIAL OR GMO INGREDIENTS Check Represents a successfully completed task. Check Represents a successfully completed task. Check Represents a successfully completed task. Check Represents a successfully completed task. Check Represents a successfully completed task. Check Represents a successfully completed task. These are so easy as a quick topper to add to your dogs food. I prepare his dry food, cut the box open with scissors, add only half of the carton on top, and then store the other half in the fridge for the next days use. I get 2 days out of each carton so a little under a months worth. He literally runs to his bowl once I set it down and will lick the bowl clean every time. My dogs seem to like these but they're rather expensive for the size. I should have looked closer so my fault,but assumed they were the same size cartons as the Caru. I do like the fact that they still pour easily after being refrigerated. Also, they're kind of a pain to open. My dog loves this. I was worried because she has clitotis but it didn’t effect her in any way.